Thanks to my friend Rushton Hurley, this evening I learned about a great new-to-me resource for mathematics teachers. 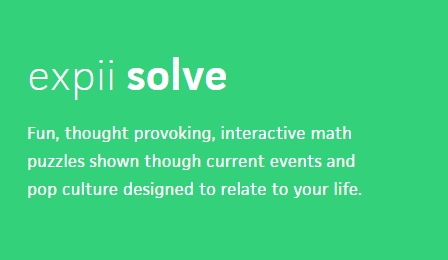 Expii Solve is a series of more than fifty sets of mathematics word problems. Within each set there are five problems aligned to a theme. For example, there was recently a set of Thanksgiving themed problems. The problems within each set on Expii Solve vary in difficulty so that you can pick the one(s) that best suit your students. Or you can let your students register on the site and self-select the problems that they want to tackle. In fact, that is how the site is intended to be used. Students can get instant feedback on their answers to the problems that they try to solve. Students who need a bit of help solving a problem can avail themselves of tutorials linked at the bottom of each problem page. Expii Solve could be a good resource for teachers who are looking for some fun and challenging mathematics exercises for their students. Many of the problems have a "real world" connection that students can understand. For example, the set of problems labeled Bargains includes a problem about the long-term cost of using a store credit card to purchase a laptop.